Editing is simple. Click edit — make your changes — click save. Wikis are designed to let you write to them — try your hand at it. (optional, mostly) sign in Most of our pages are wide open for anyone to edit. Some are limited only to folks who sign in. Unless you're signed in, your edits are virtually anonymous, tracked only by part of your computer's IP address. If you want to associate your edits with your profile, you need a logon. That's free and pretty painless. 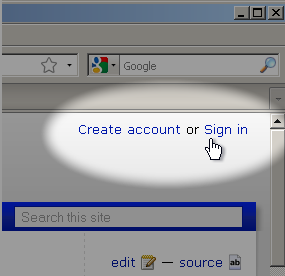 The sign-in link is at the top right of the page. open the editor On almost all pages, there's a row of links at the bottom of the page. The first is edit. Another link is at the top of the sidebar. Click one of those, and a box should appear. Ctrl-e is another way to open the editor. 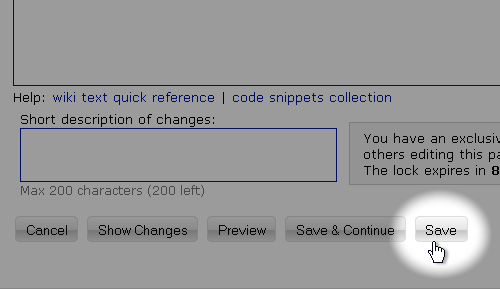 make your changes The editor box controls what's otherwise shown on the page. You can change anything in the box. Above the editor box, there are a series of control buttons to help you format text, insert links, images, and other neat tricks. If you'd like to embellish, check out these bells and whistles. Simple is also good. 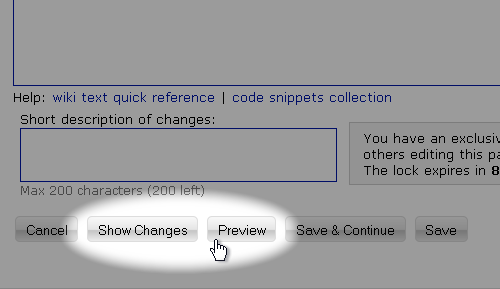 (optional) preview your changes You can preview your edits before saving any updates. There's a button for that underneath the editor. Show changes lets you see what you've added and/or deleted in this session. It's easy to revert any page back to a previous version, so really — don't worry about messing anything up. save Once you're done, click the save button at the bottom of the page. If your edits don't look right, don't worry about it. Send a help request if you're stumped. We can clean it up later. The important thing is for you to get in there and tinker.